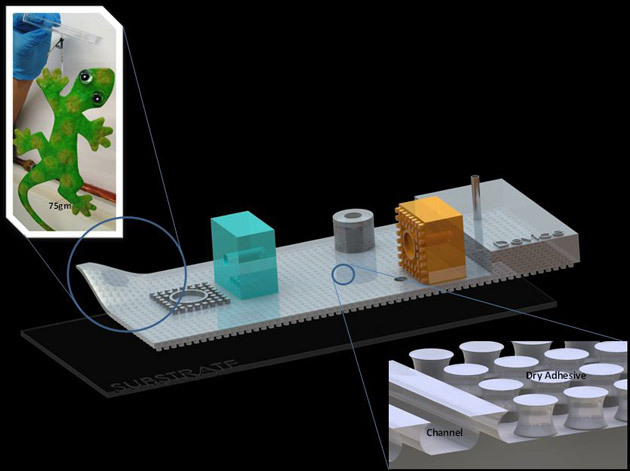 Scientists in the US have discovered that Lego bricks can be an effective way of constructing modular microfluidic systems. 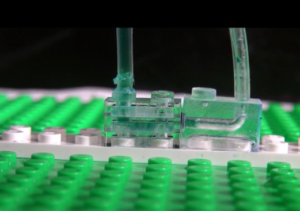 Crystal Owens and John Hart from the Massachusetts Institute of Technology used a desktop micromilling machine to drill channels as small as 150μm wide into the Lego bricks. 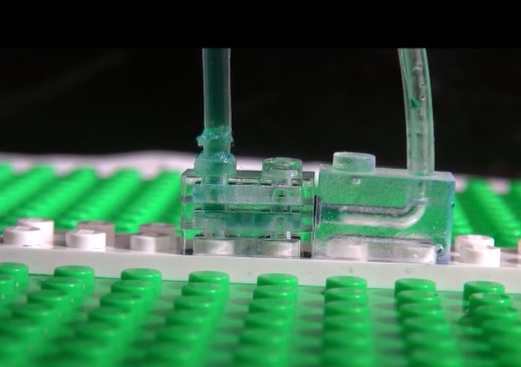 Each brick was designed to perform one or more functions such as mixing, droplet generation, sorting and sensing. “Making the system modular is a natural choice, because a system can be built piece-by-piece without knowing the final design, and easily changed,” says Owens. Read the full article and watch the video clip in Chemistry World. A remotely controlled micro-robot uses air bubbles to grip on to and assemble sub-millimetre sized components. The microgripper lifts a poly(ethylene glycol) diacrylate hydrogel disc (pink) and stacks it on top of a another hydrogel disc (blue). Gripping and manipulating sub-millimetre objects is a tricky problem in microrobotics. Mechanical grasping is difficult at micro level, and techniques such as micro-machined grippers, although very accurate, need to be tethered to a control system and so are unsuitable for work in confined spaces. To overcome these problems, Metin Sitti and his team from the Max Planck Institute in Germany have developed an untethered microgripper, which uses surface tension, rather than mechanical means, to grab small parts, such as a hair, a cloth fibre or a piece of muscle tissue. The gripper works in an aqueous environment, can grab both hydrophilic and hydrophobic items and, unlike other systems, does not need to be customised to fit to the item. A new method for monitoring the onset of sepsis touted by US researchers may assist clinicians in helping more of their patients survive this potentially fatal condition. Sepsis, often referred to as blood poisoning, can be the result of an innocuous infection or injury. Without treatment, the immune system becomes overwhelmed, leading to organ shutdown. In the UK alone, 30,000 people die as a direct result of the condition. Sepsis needs to be caught early to maximise the chances of a full recovery. However, existing diagnostics rely on antibody labelling, which requires samples to be prepared and tested by specialist laboratory staff. This requires time that a patient might not be able to spare. ‘Existing methods are too cumbersome,’ explains Joel Voldman, heading up the new study at Massachusetts Institute of Technology. Voldman’s group devised a microfluidic method that takes advantage of the white blood cells’ electrical properties, which makes it possible to detect sepsis quickly in its earliest stages. Sepsis triggers white blood cells to become activated and circulate in the blood. The number of these activated cells indicates the disease’s progression. Applying an electric field then separates activated and non-activated cells based on subtle differences in their electrical properties. Introducing graphene into microfluidic devices can make it easier to study proteins at an atomic level, scientists in the US have shown. Devices that are thinner and interfere less with the measurements allow larger and more intricate protein structures to be resolved using techniques that rely on probing thousands of microcrystals. Not only does this reduce the device’s thickness, improving the signal-to-noise ratio, the graphene also acts as a barrier to prevent the sample evaporating. John Helliwell, an expert in crystallography at the University of Manchester in the UK, explains that preventing water loss from the crystal is ‘vital…because the sample hydration state needs to be preserved for its molecular integrity’. Perry’s group are now focusing on shrinking down the dimensions and increasing the complexity of the device, as well as studying the structure of proteins involved in programmed cell death. In the US, over 30 million people wear contact lenses and each year around 60,000 contract serious eye infections that put them at risk of going blind. Thorough cleaning is vital to prevent bacterial build-up on the lens but research has also shown that an individual’s tear chemistry affects the effectiveness of cleaning solutions. The team use their device to demonstrate how tears impacts lens selection and care, and say it could be adapted for point-of-care testing in eye clinics. Scientists in China have trapped bacteria in 3D-printed structures and used them to pump materials along customised paths. Transporting materials in the microscopic world is complex. Conventionally, macroscopic pumps drive motion, but pumps are bulky and not ideal for miniaturisation. Now, Hepeng Zhang and colleagues at Shanghai Jiao Tong University have tackled this problem using native inhabitants of the microscopic world – motile bacteria. Not only are they already present in the media, but their energy conversion efficiency is estimated to be greater than existing man-made micro-motors. Scientists in Switzerland have incorporated pulsing human heart tissue into a microfluidic device to make a miniscule model of a living system that could be used to test new drugs. Scientists from Canada report an affordable manufacturing advance in microfluidics with a dry adhesive system that demonstrates strong, self-healing and reversible bonding. We’ve had microfluidics. We’ve even had nanofluidics. But now, scientists have gone a step smaller by pushing femtofluidics into the realms of possibility. Droplet microfluidics enables assays and reactions to be performed in droplets of reagent that are just a few nanolitres or picolitres in volume. The main advantages of this are that reactions can be performed in a massively parallel manner using hardly any reagent, and further miniaturisation to give femtolitre droplets promises to enable even higher-throughput with even lower reagent use. Please visit ChemistryWorld to read the full article .